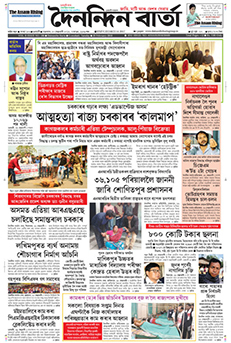 Dainandin Barta is an Assamese daily newspaper published from Guwahati since 2010. Well-known writer Naren Hazarika is Editor-in-Chief of the newspaper, while Sankar Gohain is the Editor and Dimpul Chutia is the Executive editor. The newspaper has 12 pages of news and articles, and also has Dainandin Barta Epaper. At present, it has one print edition from Guwahati.